Nothing says football like a gorgeously layered taco dip with refried beans, seasoned beef, sour cream, guacamole and loads of cheese. Unfortunately, it comes with 300 calories per serving (depending on which recipe you use). My recipe redo layers it the right way…slimming it down to just 130 calories per serving while being equally as delicious as its fattening counterpart. Score! Heat a non-stick skillet over medium heat and add black beans and taco seasoning. Cook until warmed through and fragrant (about 5 minutes). Press beans with the back of a spoon so about 1/2 the beans are smashed. In a large baking dish, evenly spread black beans on the bottom. Layer corn on top of the beans. Add Greek yogurt on top of the corn. 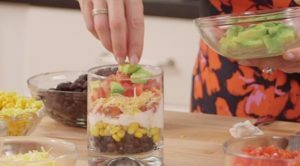 Layer salsa on top of the yogurt. Add the cheese as the next layer. Sprinkle avocado, tomato, bell peppers, green onion and optional jalapeño pepper on top of cheese. Enjoy with your favorite veggie scoopers. Note: Alternatively, layer about 2 to 3 tablespoons of each layer into small clear cups and serve as individual portions.